he whole Bible points to Jesus. We need to keep our eyes on Jesus, who both began and finished this race we're in (Hebrews 12:2). In Fixing My Eyes on Jesus from award-winning author Anne Graham Lotz, you will read a Scripture and inspirational devotion for each day of the year that will encourage, uplift, renew, and challenge you on your spiritual walk with Jesus. A perfect size for carrying with you on the go, in a beautiful package that also makes this a gorgeous gift for a friend or family member, Fixing My Eyes on Jesus is the spiritual nourishment you crave. 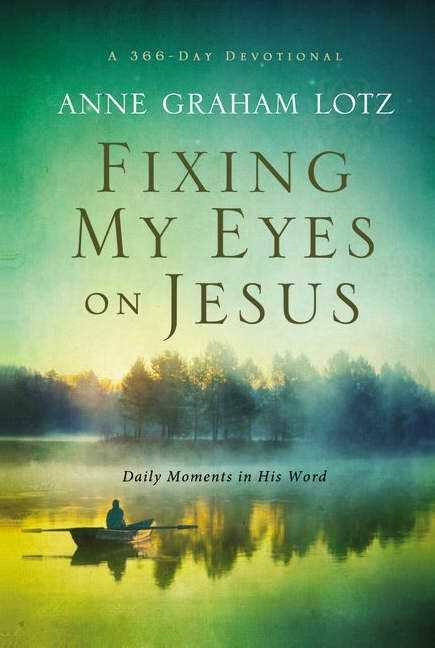 Fixing My Eyes on Jesus by Anne Graham Lotz was published by Zondervan in January 2013 and is our 7386th best seller. The ISBN for Fixing My Eyes on Jesus is 9780310327844. Be the first to review Fixing My Eyes on Jesus! Got a question? No problem! Just click here to ask us about Fixing My Eyes on Jesus.